There are a few culinary treasures that the state of Texas holds near and dear to its heart. I’m talking chicken fried steak, cheese enchiladas with chili gravy, Texas toast, and steak-on-garlic sandwiches. Brisket is done best in the great state of Texas. Iced tea is always served with sugar on the side. One sweet older cooks always seem to bring to celebrations is the Texas sheet cake. I’m not sure where it comes from, but I’ve seen it time and time again. They’re served everywhere in Texas: funerals, birthdays, and given as gifts. We even had a woman give us a Texas sheet cake after we interviewed her one time. 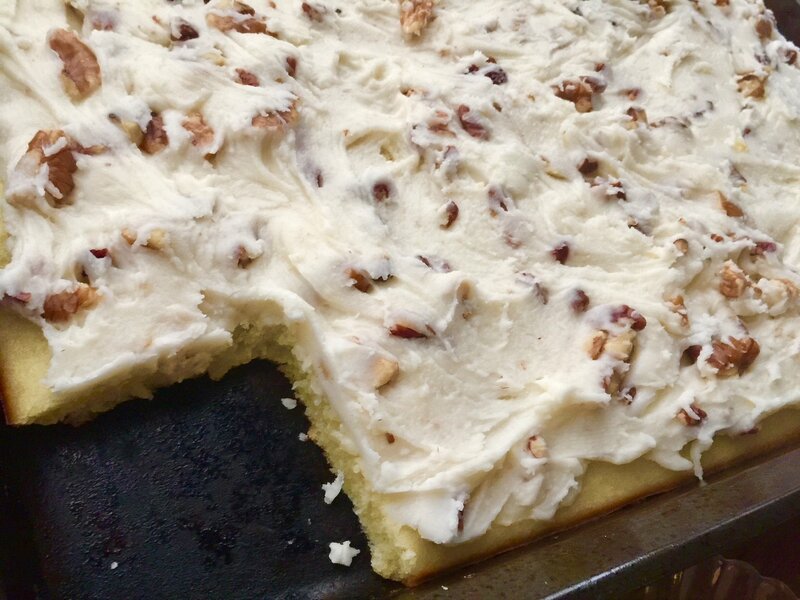 Here’s how the quintessential Texas sheet cake is made. It starts with a thin and tender layer of decadent chocolate cake, topped with chocolate-frosting glaze while still warm, and then sprinkled with a heavy dose of chopped nuts (typically pecans). The cake ends up tasting like a wonderful cross between a brownie and a chocolate cake. They’re also always served in the pan they bake in (a rimmed sheet pan). Don’t think of this like the normal sheet cake you get from a bakery for your child’s birthday. This is much thinner than that, and way more delicious in my opinion. Funny story—my boss always gets a cake for employees when they move on to different markets. One of the first cakes he had to get, he didn’t understand sheet cake sizes. Instead of getting a half or quarter sheet, which is a good normal size for a crowd of about 20, he got a full sheet cake. In walked the biggest cake I’d ever seen. It almost didn’t even fit on the conference room table. He learned after that that full sheet cakes were just a tad bit too big! Now, the Texas-ified version. I didn’t want to make the normal one with chocolate so I opted for a white, almond-flavored version. I believe this recipe hails from a Taste of Home booklet, with my own spin of course. I’ve got to tell you, this is probably the best thing I’ve ever baked. 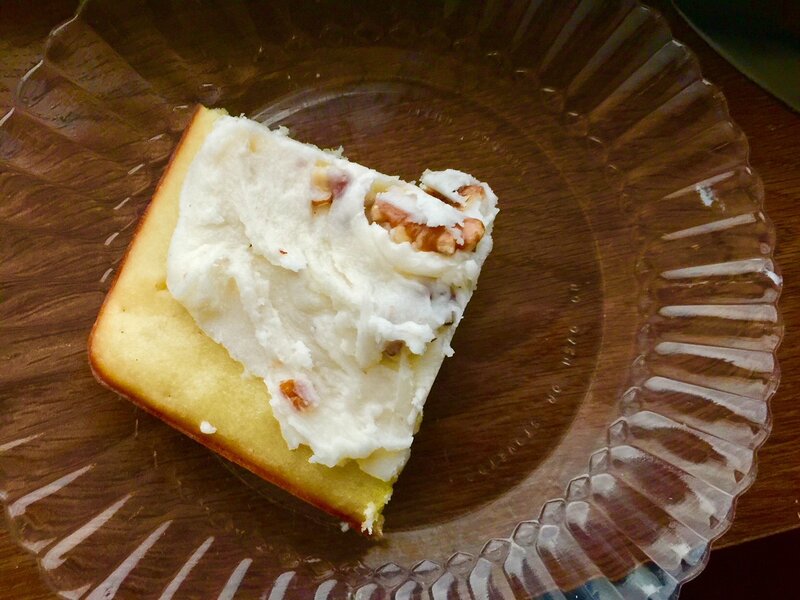 It was so moist and flavorful (almond extract is a nectar from the gods) and the frosting was just superb. 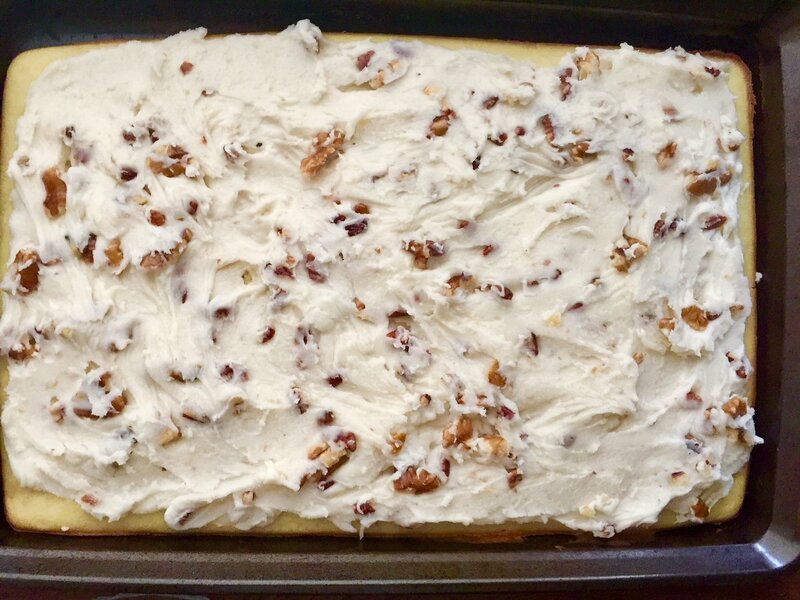 One thing I should’ve done was roasted the nuts before adding them to the frosting. I also decided to wait a little longer before putting the frosting on the cake, so it was more thick than glazey. I took this cake to work yesterday and everyone was raving about it! It was even better the day after I made it. 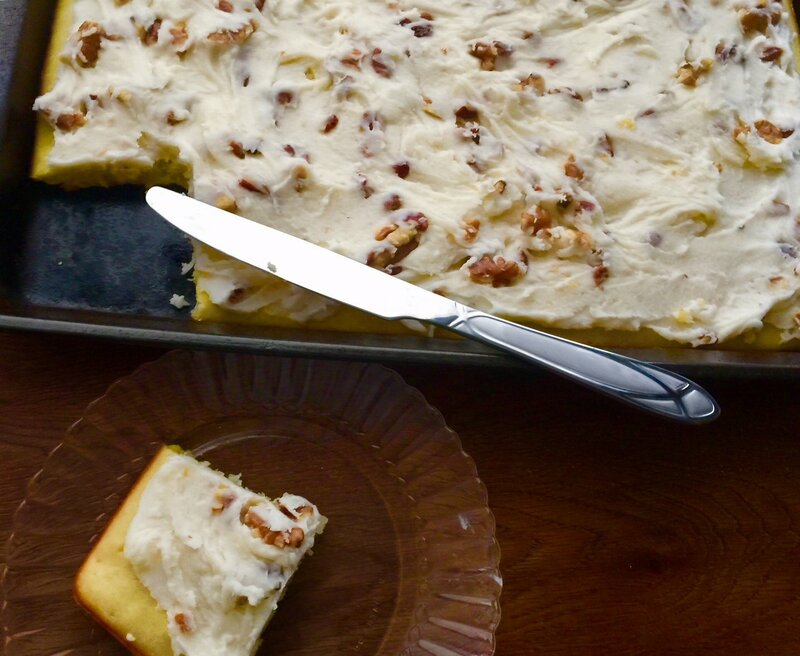 Moist, almond-flavored sheet cake with a thick white icing and nuts. Preheat oven to 375 degrees. 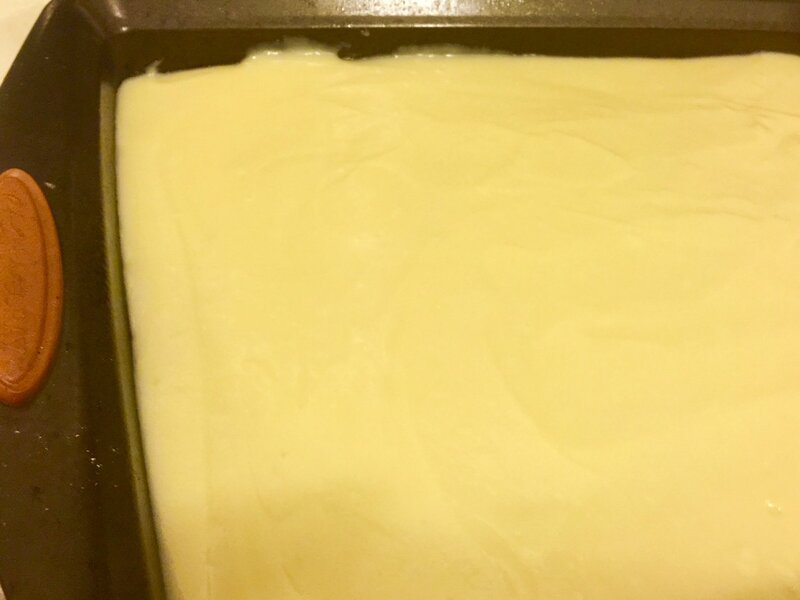 Grease a 15x10x1″ baking sheet. 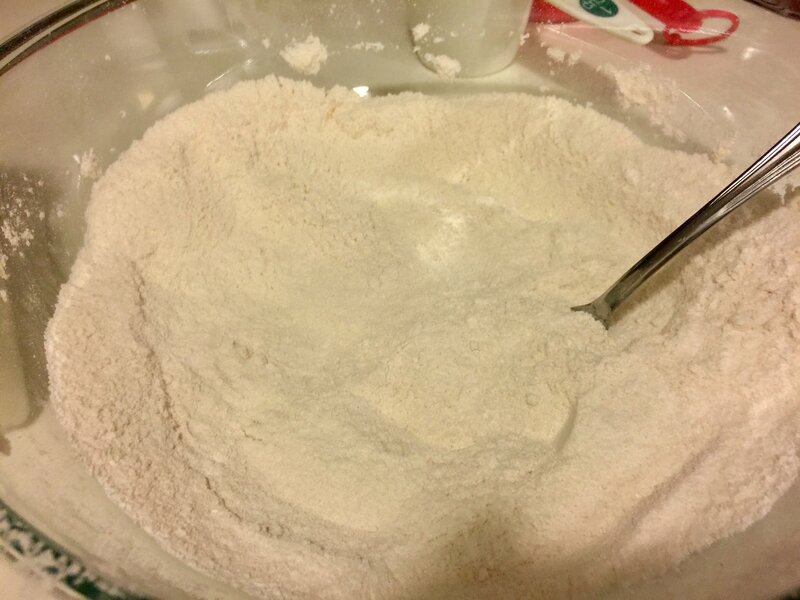 In a large bowl, sift together flour, sugar, baking powder, salt and baking soda. 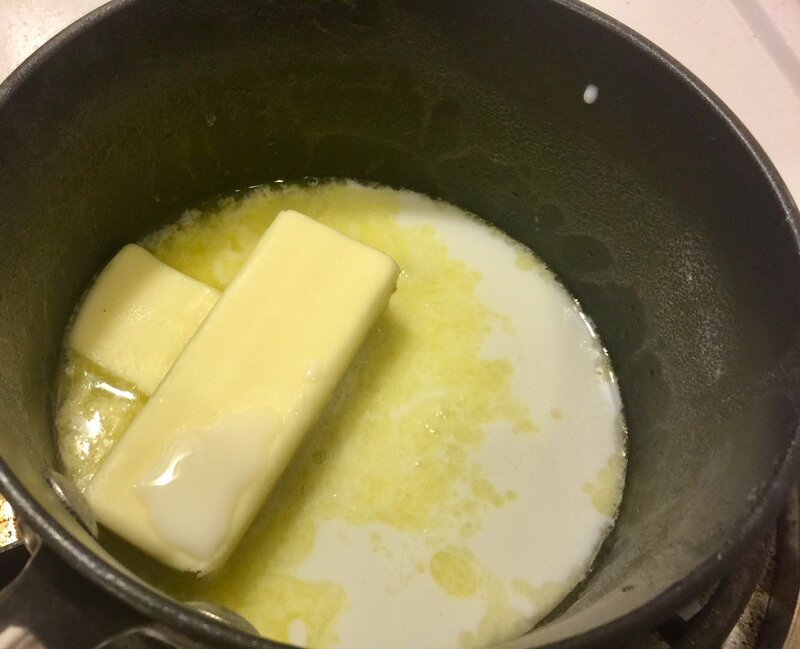 In a small saucepan, melt butter with water. Bring just to a boil and then remove from heat. Pour into flour mixture and stir until there are no lumps. Meanwhile, in a small bowl, whisk together eggs, sour cream, and almond extract. Pour into flour mixture and stir until smooth. Pour batter into prepared pan. Bake for 18-22 minutes, or until a toothpick inserted into the center comes out clean. Let cool in pan on wire racks for 20 minutes. Make the frosting: In a saucepan, melt butter with milk. Bring to just a boil and then remove from heat. Pour into a bowl. 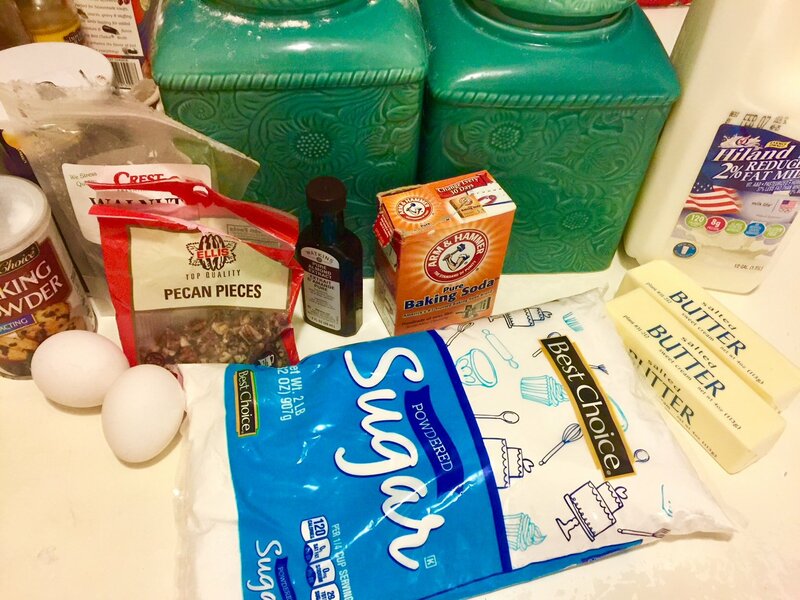 Stir in powdered sugar, about a cup at a time, until incorporated. Stir in almond extract and nuts. Spread over warm cake. 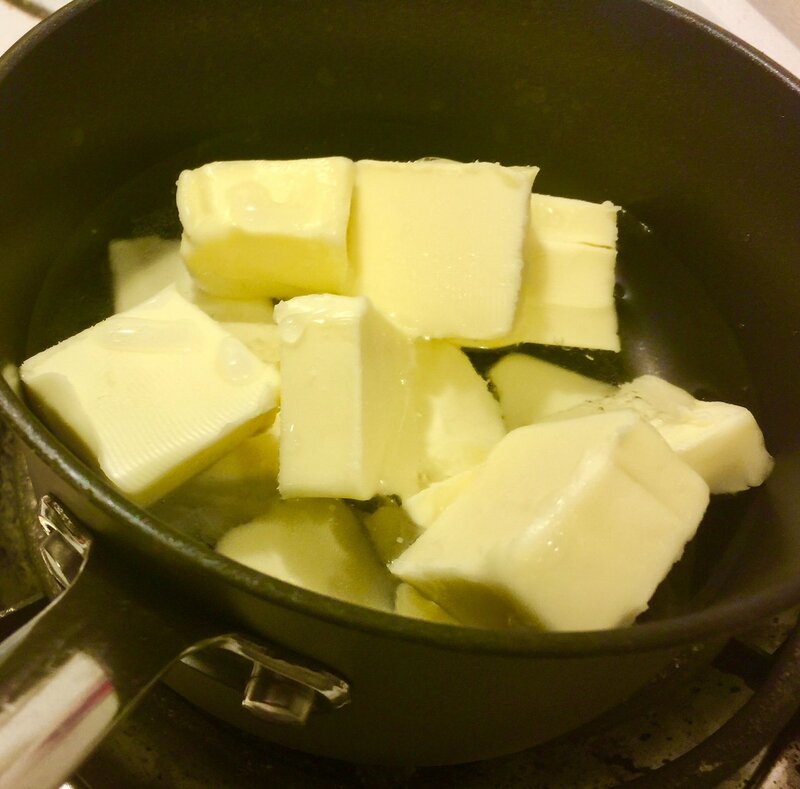 In a small saucepan, melt butter with water. Bring just to aboil and then remove from heat. Pour into flour mixture and sit until there are no lumps. 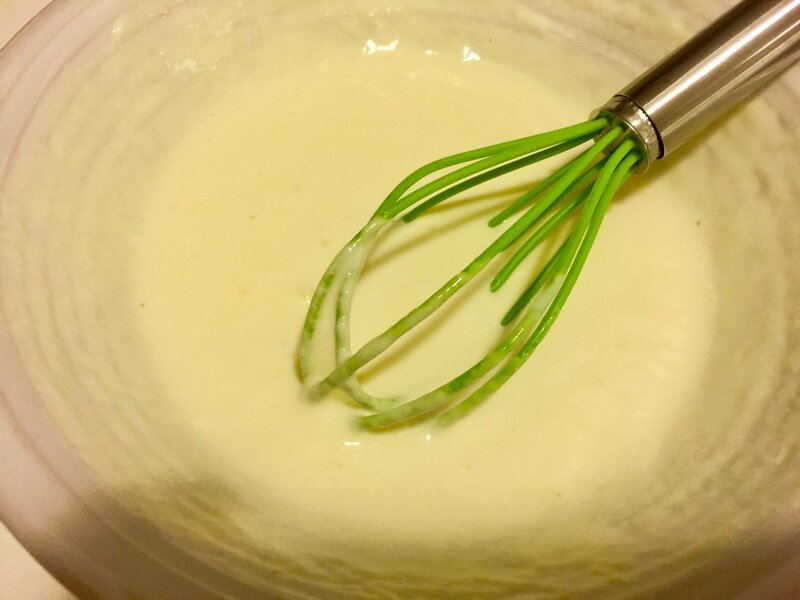 Make the frosting: In a saucepan, melt butter with milk. Bring to just a boil and then remove from heat. Pour into a bowl. Stir in powdered sugar, about a cup at a time, until incorporated. 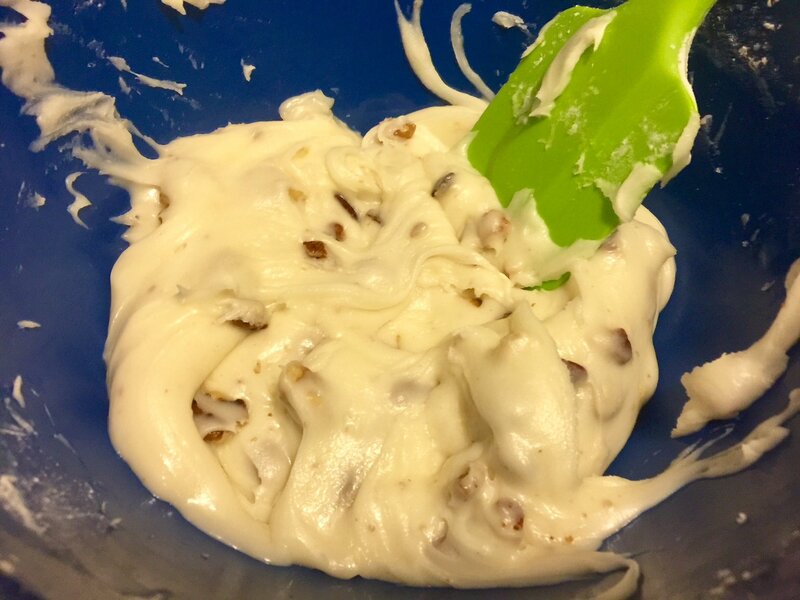 Stir in almond extract and nutes. Spread over warm cake. In an enchanted world where one can eat anything, this would be my breakfast!